Dutch development organisations have been crossing their fingers. Funding is ending this year for MFSII, so organisations have been working hard on their proposals for the call ‘Dialogue and Dissent’ (Samenspraak en Tegenspraak in Dutch). Friday the long awaited announcement by the Dutch Ministry of Foreign Affairs came for this new round of funding. There were 25 winning coalitions out of the 65 that applied. That means that there are also many that were disappointed. I do not have the full list of all the applicants, but I compared the list of coalitions that received funding for MFSII with those for ‘Dialogue and Dissent’. The graph below was produced with Social Network Analysis software (Netdraw) and groups the organisations that have joined in the various coalitions. 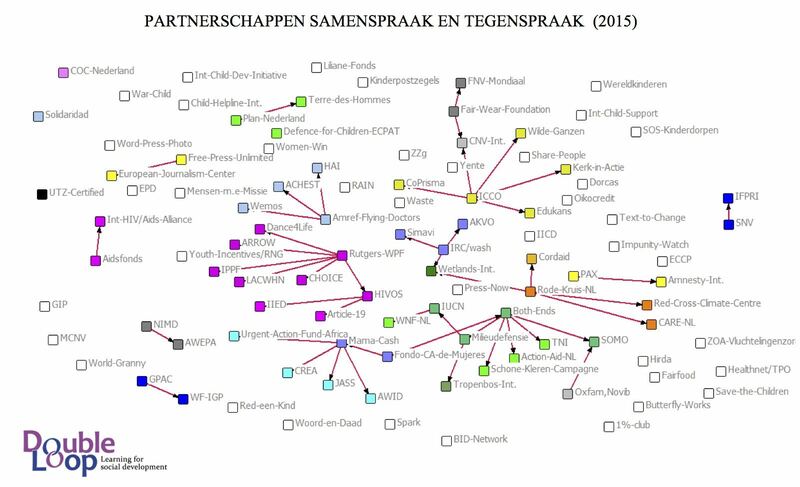 This produces an interesting panorama of the landscape of Dutch development organisations and their international allies. When only showing the partnerships for ‘Dialogue and Dissent’ (see second graph) the organisations that will benefit from the new round of funding stand out. I coloured them according to the coalitions, although some organisations are in two coalitions and a few have applied on their own. The organisations with white squares will not receive funding this time. The Ministry has encouraged coalitions to include international organisations in their partnerships. 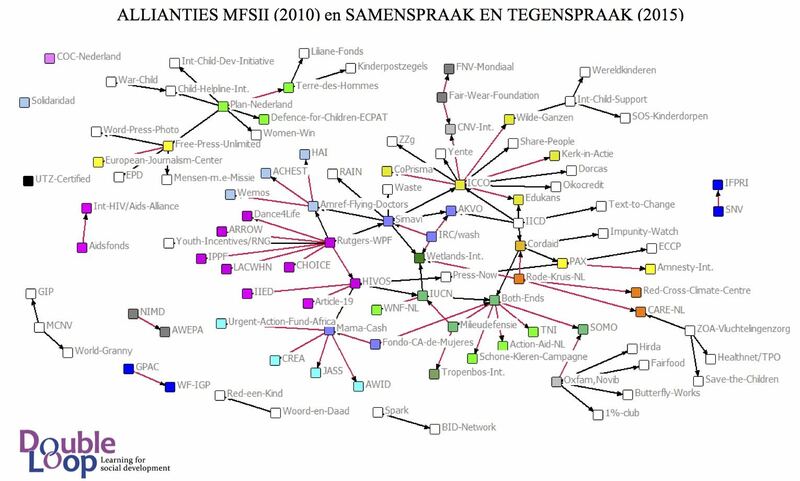 So, even though the number of organisations that get funding has only decreased from 73 to 64, you can see that fewer Dutch organisations are included compared to MFSII. Times are challenging for them and it would be interesting to make a network analysis of the partnerships they are establishing to increase chances for funding from other donors. One element missing from these graphs is the Ministry of Foreign Affairs itself. ‘Dialogue and Dissent’ is meant to establish strategic partnerships with the Ministry in the area of Lobbying and Advocacy. Each proposal also had to explain the role of the Ministry in the Theory of Change of the applicants. From that logic the Dutch Ministry of Foreign Affairs should be placed right in the middle. Like a spider in its web? Or perhaps like a caterpillar in its cocoon waiting to become a butterfly?